The 15th International Symposium on Heavy Vehicle Transport Technology (HVTT15) supports the development of a safe, sustainable, efficient and productive road freight transport. The event offered a worldwide platform for researchers, policy makers, regulators, road agencies, heavy vehicle manufacturers and suppliers and the transport industry, to exchange knowledge and experiences. The central question during the HVTT15 was how to integrate fast technological and socio-economic developments that affects road freight transport in existing structures: ageing infrastructure, historical grown cities, established market structures and social order and ingrained habits. Sophie Punte presented on “Professionalized Road Freight Operators for Truck Fleet Energy Management.” Building the capacity of transport managers covers fuels, vehicles, drivers, ICT and performance monitoring. 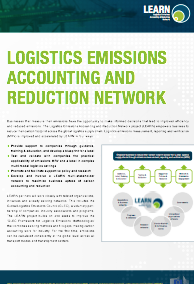 The GLEC Framework is this way introduced to road freight operators to calculate fuel use and enables them to report reliable emissions to customers. Check out Sophie's presentation here.